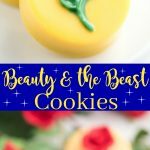 Beauty and the Beast Cookies - chocolate covered OREO cookies topped with a rose, perfect for a Beauty and the Beast party! Melt red candy wafers in microwave, mixing every 20 seconds. Use a piping bag to carefully fill the rose detail. Place in the refrigerator for a few minutes to cool chocolate. Then melt the green candy melts and use a piping bag to fill in the stem and leaves. Place back into the refrigerator to harden. Place 1 cup of yellow candy melts in a microwave safe bowl. Stir every 30 seconds. Spoon or pipe chocolate into the mold ¾ of the way. Place OREO thin cookie in center and cover with yellow chocolate until you can no longer see the cookie. Allow chocolate to set before removing from mold.